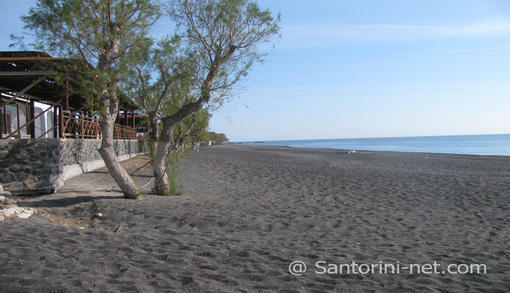 Kamari beach is located on the southeast of Santorini and is the most popular beach on the island. 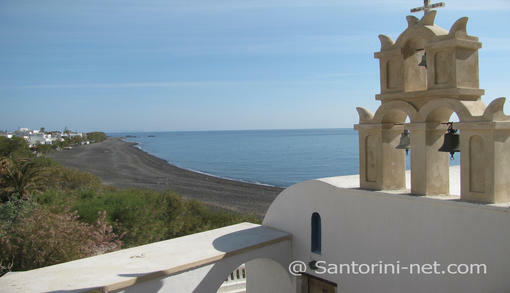 It is close to the airport (4 km) and 12 km far from the port of Santorini. The access is easy by taxi or by private and rental cars and a regular bus service. Especially in the summer, schedules are quite dense. 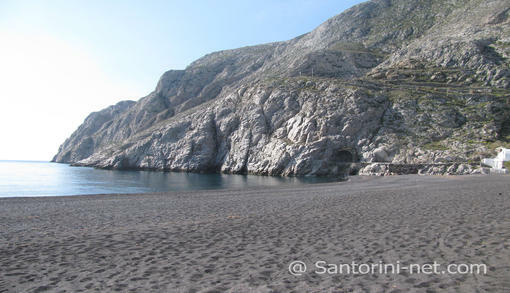 Kamari beach is miles long, has clear water and superb view as it lies under the impressive mountain of Mesa Vouno.There is a long stone paved promenade for strolling that runs parallel to the beach stretches across the crescent moon shaped bay. This is closed off to traffic during the summer months. 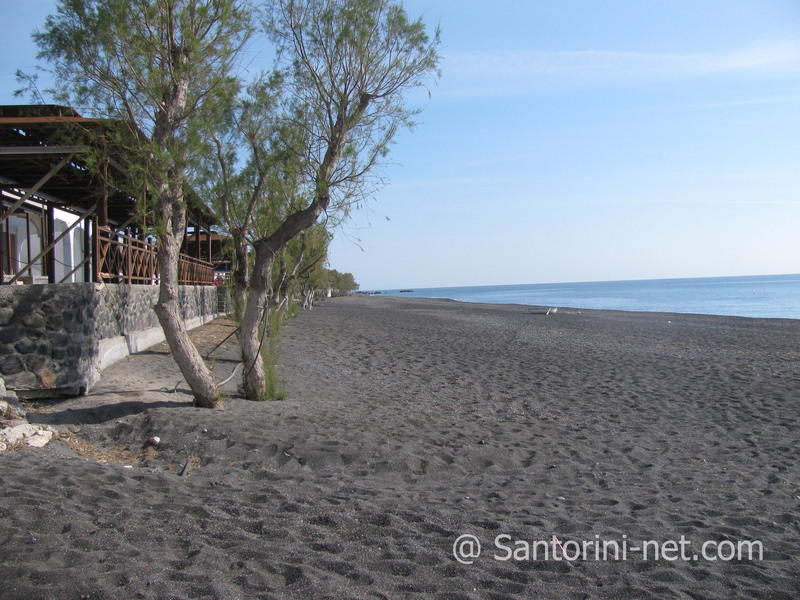 This beautiful beach with the black sand and pebbles and the clear blue waters, attracts the most visitors because of the large number of modern tourist infrastructure and amenities of Kamari village. So here you will find some of the most popular Kamari hotels and accommodation offering first rate services and facilities for all tastes and budgets. Kamari beach is a cosmopolitan beach, fully-organized, providing lifeguard, comfortable straw umbrellas and deck chairs for relaxing moments in a fascinating setting. There is also a scuba diving school, which offers a wide range of courses in scuba diving and snorkeling, so get ready for exciting experiences. Along the beachfront promenade of the Black beach you will also be delighted to find shops, restaurants, taverns, cafes and popular bars so take your time to relax and enjoy the superb view while savoring your favorite drink. This is the only beach on the island that has been awarded the Blue Flag of European Union, which guarantees its clean waters. Find out how clean and cold they are by diving yourself. But if you are not a very good swimmer watch out as its waters are deep. 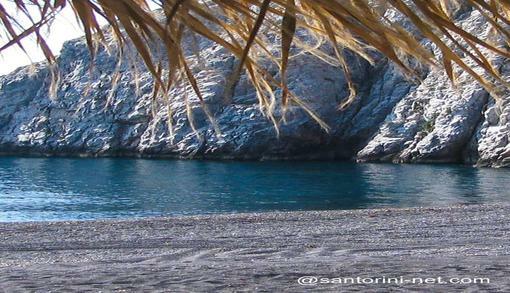 The sand is hot so take your flip flops! Kamari beach gives you the opportunity to make small explorations and excursions in the surrounding area as you can get the boat and go to the nearby island of Anafi, or on the other side of the cliff, in Perissa. Also, take a look at the ancient remains at nearby of Ancient Thira (just 3 km), which date from 3BC and include an impressive amphitheatre. The trip on the mountain is unforgettable and the views from the site are amazing.